Ever since she was a little girl growing, Luisa Zhou wanted to be the CEO of a major corporation. She just knew that the power, the money, the prestige that came with this would make her happy. What was the ‘MORE‘ that this self-described introvert was searching for? Afterall, she’d been an International Space Station engineer, a mobile payments start-up co-founder, and a digital advertising manager for companies looking to fuel their marketing with artificial intelligence. She wanted to to start her own business but… she had to overcome the fears that were holding her back. The fear of failing, of giving up the safety and prestige of her corporate life. Why not me? Why not now? What’s the worst that could happen? She got comfortable with being uncomfortable. She faced her fears and went from employee to entrepreneur. How her first group coaching program launch went from a complete bust to a six-figure success. How she used Facebook challenges to grow her business. And the EXACT steps she took to generate over $800K in sales in her first course launch! Best of all, you’ll discover how embracing Luisa’s “Why Not?” mentality can help you to go BIG and take massive action! OK — ready to Deconstruct Luisa Zhou’s Success? Let’s go! The exact steps she took to generate over $800,000 from her first product launch. How, why and when to leave your job so you can become your own boss. What it takes to create a successful six-figure program launch, with absolutely no list or online following. 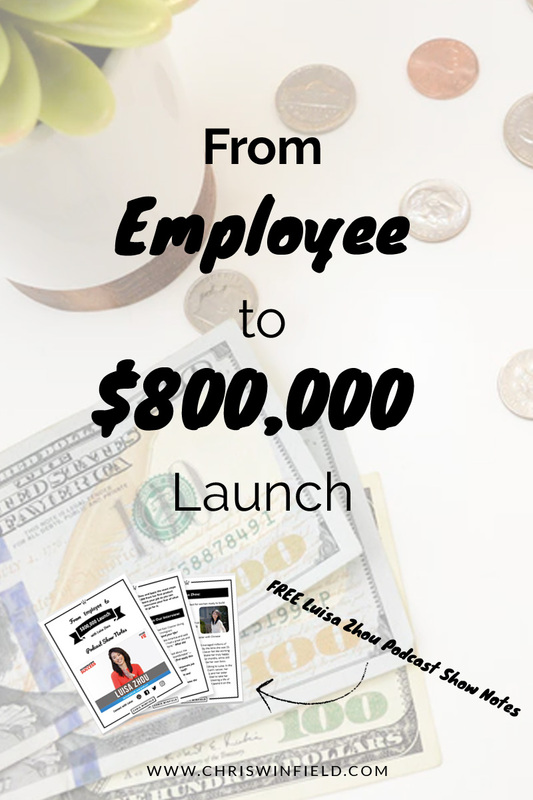 The specific actions she took to go from “employee” to “employee with a side-hustle” to “100K+ in coaching clients” to a “7-figure business” owner. How she overcame her fear of self-promotion and how you can too. We’ll cover all of that (and a lot more) in this exclusive interview with Luisa Zhou in Episode #12! You’re a Southern girl (from Texas) turned East Coaster (living not too far away from me) with Chinese immigrant parents. How has all of this diversity shaped your life? You began your career working in corporate America and said that “…on the outside, things looked good. I had a great job and a great salary, but the truth was, I wanted more.” What did “more” mean to you? I was listening to an interview where you talked about the importance of being “comfortable with being uncomfortable” — what does this mean to you and when did you first apply this mindset in your own life? How did you transition from a very structured corporate job to becoming your own boss and working for yourself? Can you walk us through your goal setting process and approach to getting everything done? You’re a self-described introvert, how did you overcome the fear of self-promotion? Discover the “Why Not” mentality to going BIG and taking action! How to leave your high-paying corporate career so you can become your own boss. How to set big goals and achieve results that exceed your wildest expectations! How to overcome your fear of what others think and just go for it. Have you enjoyed this podcast episode with Luisa? I made a complete print out with all resources and show notes. Grab yourself a copy by clicking the image below! 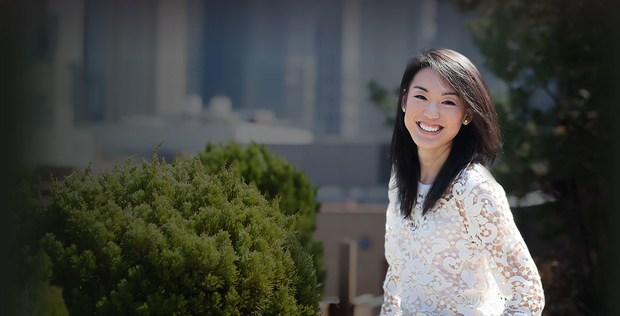 Luisa Zhou is a Business Architect for women ready to build their dream multiple 6-figure businesses. In past lives, she’s been an International Space Station engineer, a mobile payments start-up co-founder, and a digital advertising manager for companies looking to fuel their marketing with artificial intelligence. She’s a Southern girl turned East Coaster with Chinese immigrant parents. She climbed the corporate ladder and managed millions of dollars in advertising revenue per year by the time she was 25. Despite being a “success” on paper, she never felt like working on someone else’s business would ever make her truly happy. After making over $100,000 in sales in four months, while still in a 9-5, she decided to quit so she could be her own boss. Family is hands-down the most important thing to Luisa. In the span of 2 years, her mother was diagnosed with cancer, her father had an emergency life-saving surgery, and her sister suffered a freak snowball injury that threatened to take her sight. This is why she’s such an advocate for creating a life of freedom—because when you have it, you can spend it on the people who mean the most to you. Luisa describes what it means to be a high achiever. 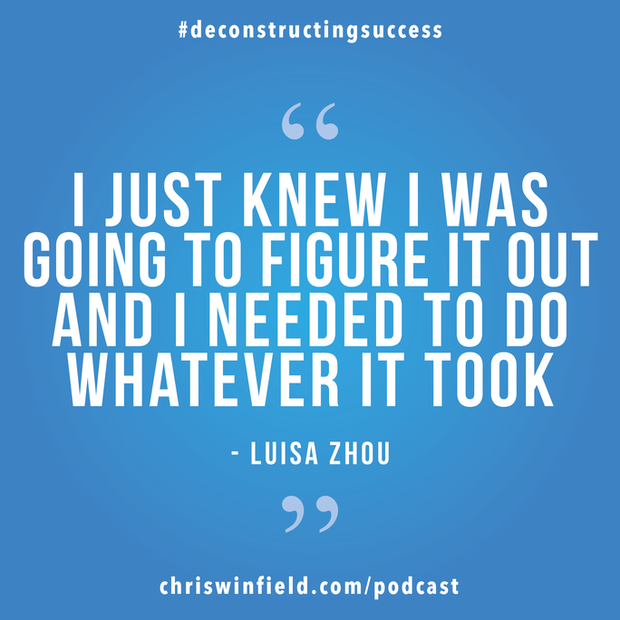 Find out how Luisa’s Chinese immigrant parents shaped who she is and why she eventually quit the “safe” career path they always wanted her to take. Luisa shares why the CEO of Avon was her biggest role model growing up. Why money alone is an empty goal and the importance of doing something that matters to you. Why a corporate career left her feeling empty and how she walked away from a 6-figure salary to live a more present life. Why running a successful business never gets easy and how to get comfortable with being uncomfortable. Luisa shares how answering questions and providing value allowed her to leave corporate America and start her first online business, despite having no experience! Why you’ll never succeed as an entrepreneur if you’re not willing to try different things and fail along the way. Discover how the “Why Not” mentality can help you to go BIG and take massive action! Luisa breaks down how her 1st group program launch went from a complete bust to a six-figure success AND learn how she used Facebook challenges to gain customer attention. Learn how Luisa sets BIG goals to achieve MASSIVE results and how this process lead to an $800,000 program launch! How to focus on the most important task of the day so you can achieve what matters the most. Find out how Luisa (self-described introvert) overcame her fear of self-promotion and just went for it. Why there’s always another level to pushing yourself. Don’t forget to download the complete show notes by clicking the image below! [0:03:09] Chris: Luisa, thank you so much for being here with me today. I am so thrilled and so excited to talk to you. [0:03:16] Luisa: Thank you so much for having me here. I’m so excited to be here. [0:03:19] Chris: So when someone asks you, “What do you do?”, what do you tell them? [0:03:24] Luisa: Yeah. Absolutely. So what I usually say is I’m an Online Education Entrepreneur who helps high achievers build side businesses based on their experiences, and turn them into potentially full-time business, that really either match or exceed their corporate salaries. [0:03:44] Chris: How do you define high achievers? [0:03:46] Luisa: Anyone who wants to go out there and build a business, or do something more than what they have right now. [0:03:53] Chris: Gotcha. So what would a typical person that would fit that profile look like? [0:03:59] Luisa: Really, to be honest, it’s anyone who is grateful with where they are now, of course, but who’s just unsatisfied, who deeply knows there’s so much more and is willing to do the work or do what it takes to get it. [0:04:15] Chris: Gotcha. OK. So we’ll dig into that a bit more. I’m just always curious as to people’s different definitions. So you’re a Southern girl from Texas turned East coaster. You live not too far away from me in New York City. You have Chinese immigrant parents. So how has all that diversity shaped your life into where you are right now? And so, really, it took a lot of just self-study and just self-motivation, and just kind of this belief in my dreams to be able to overcome all of that. And I’m sure a lot of the listeners feel that way too, where there was no family support. [0:05:20] Chris: What did your parents do? So they immigrated from China and what did they do here in the States? [0:05:25] Luisa: Yeah, absolutely. So my father is an engineer. He works for Boeing. And, really, all he ever wanted was for me to follow in his footsteps and just have that great life. When they first came over, it was really hard for him to get a job. And so he had this mentality, if you’re an engineer, you can always find a job and you’ll be safe. And that’s really what they wanted for me. [0:05:45] Chris: Gotcha. So it was more looking for the safety, the security, that, I guess, they saw that corporate America or a nine-to-five job provided? [0:05:55] Luisa: Yes, exactly. They never wanted me to have to worry about the things that they went through when they first came here. [0:05:55] Chris: Gotcha. So I was reading somewhere and it said that since you were a little girl, you wanted to be the CEO of a major corporation. And it sounded like the power, the money, the prestige it came with this would make you happy. So did that come from growing up with that mentality or was that something different? [0:06:22] Luisa: Yeah, I think, to be honest, that was something I was born with, but when I was thinking about this, I think it was because I didn’t really understand when I was little what it really meant. I just thought, “Oh, it’s the power, the money.” Yes, all of that is, of course, absolutely wonderful. But what I really wanted was to matter. And I think that’s what so many of us want to do. So really, just not be just another person who is doing this job that you could leave tomorrow and nobody would really notice or die tomorrow. I mean, the people closest to you would miss you but nobody else. And I have definitely continued to feel that way, but just in the sense of, all right, in the grand scheme of things, this is what I want versus just the money, the power that you see on TV that CEOs have. [0:07:10] Chris: Were there any CEOs or people that were your role models or your heroes growing up? [0:07:35] Chris: Do you remember how old you were when you knew about her? I’m just curious. [0:08:27] Chris: It’s interesting that you said, that doing something that mattered. When did that hit you that you really have that feeling or is that more looking back now? I’m just curious because that’s a pretty heavy or pretty deep insight for somebody to have, and to really be able to put it concretely, I guess. [0:08:47] Luisa: Yeah. To be honest, it was definitely a relatively recent realization. I think something that I’ve realized just within the last few years before that. I grew up in this middle-class family. It’s not like we ever lacked for anything but it wasn’t like money was overflowing. And so my number one focus was always I’m going to do this. And as a result, I’m going to have all of this money to take care of my family. [0:10:01] Chris: So let’s get into that. So you began your career working in corporate America and said, “On the outside, things look good. I had a great job and a great salary, but the truth was I wanted more.” So what did “more” mean to you? And I think you might have just answered that a bit. But how did that start to come to the surface or lead you to actually want to do something about it? [0:10:23] Luisa: Yeah, absolutely. So more for me just meant, at the time, I didn’t really know what kind of shape that would look like. I just knew that I was, like I mentioned earlier, deeply grateful for what I had already accomplished. And my parents would tell me all the time, “You’ve got a really great salary, great career. Don’t even think about anything else.” But I knew that I was also deeply just not content with where I was in life. And it wasn’t this feeling that I knew tangibly where it was directing me but I just knew that I was just not satisfied. [0:10:56] Chris: Can I ask you a question? How did that play out? And what I mean is you have on the outside, somebody looks at you and you’re like, “She’s got it all. She has a great job. She makes a lot of money. She has it all together. She’s young.” But you felt something wasn’t there. So I’m just curious how that plays out? What are, I guess, the side effects of that in your life – if that’s the right way to say that – or from people that you’ve worked with? What are some of the ways that that comes to the surface? [0:12:43] Chris: Yeah. I love that the idea of there’s a picture of me from a different point of my career. On the outside, I have everything, and it’s a picture of me with my daughter. And I’m sitting there; And you can look in my eyes, and I’m not there. I’m there, but I’m not there. And so when I always look back to the whole idea of just not being in present and never being present, so I think that that sums it up so well. All right. So what did you do? How did you kind of decide that you’re not going to just keep repeating this, of sitting in that movie theater ten years from now and being like, “All right, I know I should be doing something in 20 years, and then 30 years.” So what did that look like for you? [0:13:19] Luisa: Yeah. I think, for me, it was just a really long journey. I want to make it very clear. It wasn’t like one day I just overcame my fears immediately. And you’re not out there and like, “I’m going to do this.” It was so much back and forth, to be honest, kind of like when someone is trying to lose weight and you yo-yo back and forth. That’s really the best example. So I started just doing some things on the side. And it really helps that at one point, I met someone who is really passionate about starting this mobile payment, this tech company. And he was just starting out. So I was able to help him co-found it. And that really gave me my first taste of, you know, let’s kind of start a business, raise money and see what’s possible. [0:13:58] Chris: Can I ask you, Luisa, where did you meet him? So I’m always curious when somebody says they started doing things on the side, and just how many different things that can mean. So did you get it in your head, “Listen, I want to start doing stuff. And then things started happening.” Did you go out? I’m just curious. [0:15:52] Chris: I love that. I was listening to something where you were talking about one of my favorite exact words, “comfortable with being uncomfortable.” And that’s it. So what does that mean to you and when did you first get comfortable being uncomfortable. It sounds like that’s where this all came from. [0:16:10] Luisa: Yeah, absolutely. So to be honest, I mean, this is something that I’m still working on. And I don’t really expect that I’ll ever be completely comfortable because there’s always a new level. [0:16:19] Chris: New levels, exactly. [0:16:21] Luisa: Right. And what it means for me is I think a lot of people have this idea. And I know I did too, that when you get to a certain point, things are going to be easy. When you get your first client or your first hundred thousand or your first million, it’s going to get easier. And what I realized was it really doesn’t. You just move on to the next stage. And when I think I first got comfortable with being or started to was thank goodness. I think sometimes I just have-I’m a little bit-I don’t know the right word for really stubborn and a little bit stupid, too stupid to know when to quit. [0:16:58] Luisa: Yeah, exactly. When I was starting this business, I just knew I was going to figure it out and I needed to do whatever it took. And so I ended up investing about $60,000 before I made any money. I didn’t have that much cash lying around. So I was just putting it on my card. And it was a big deal because I’ve never had any debt. And I was in here thinking, “If I tell my parents that, they are going to have a heart attack. But it was kind of like, “Well, I need to this. I want it badly enough. And I’m just going to make it happen.” And kind of like put on the blinders and don’t think about how scary it is. [0:17:36] Chris: Yeah. So you get there. And now, what’s like that first steps, so that you’ve realized you’re going to do this. So you’re back in corporate America, you’re doing well by all accounts, you’re getting promotions, but it doesn’t strike the chord that you needed to in order to feel right. So what do you do? You know you have to do something. So let’s back up. What happens next? The next thing I tried was career coaching because that was like, “I know how to get a new job in a new industry. I know how to get promotions and raises. I can help people with that.” And I actually was able to get a few clients that way thankfully. But what I realized was I don’t really want to be talking to you about this. [0:19:45] Chris: You’re trying to do the opposite. And at that time, I didn’t even know what I was going to sell. So I said, “Please hold on. Give me a week. Let me figure out what I’m going to do.” So I just really scrambled and got back to her. And a week later, we chatted. I just remembered that call so well because I didn’t know how to have a sales call at that time. I had just randomly found a script online. I was just sweating bullets. And thankfully, we already had that established relationship. And so, I said, “This is what I love to do with you. And this is the investment.” And she just said “Yes.” And that was how that started. [0:21:04] Chris: Yeah. I love that. So, all right, she says, “Yes.” You’re still working. What were you doing with her? [0:21:27] Chris: And you were in online advertising, right? So that was where you had the experience and background? [0:21:33] Chris: OK. Gotcha. So you start working with her and what? [0:22:21] Chris: Wow. So I’m curious. When somebody says to you now – I’m going to fast forward for a second and then come back – but somebody says, “Look, I don’t have time to spend on these forums or groups or get on calls and do stuff for free.” When somebody has that mentality, what do you say or what’s your advice to them because I’m guessing that it’s come up before? [0:22:44] Luisa: Yeah. Absolutely. So when someone says something like that, I take kind of a tough love stance because you’re not going to succeed as an entrepreneur if you’re thinking, “I can’t do this. What if it doesn’t work? Let me not bother to do that.” It’s about trying different things not knowing what’s going to work but knowing, sooner or later, something will. If it was easy to build a business or do whatever you wanted, everyone would be doing it, right? And so if you wanted this badly, you have to think about it. You’re creating something that potentially is going to completely change your life. What is a few hours or a few days/week/months, whatever, to be able to do that? You want badly to be able to travel the world, have the life you want? You tell me how much that’s worth to you. [0:23:29] Chris: Yeah. It’s interesting because two of the things that you’ve touched on without saying it specifically, but gratitude, being thankful for where you are, which I think is hard for people when they’re like, “Well, I want to be doing something else. How can I be grateful for what I’m doing now, but how important that is.” – I’m saying this to remind myself as well – and another is just being of service and doing things without necessarily expecting anything in return and how important that is not just when you’re starting out, but it continues to be just in different ways. But those are two really important things. All right. So you have these clients. Now, what happens? So she and I spoke maybe on Wednesday. By Monday, I had created my own group. I was like, “All right. I’m going to use a challenge to launch this off. [0:25:16] Chris: I want to stop you for a second because that’s, I think, something that separates you. So you had all the internal scripts that come up in all the learnings, I believe, like “I don’t have a list. This isn’t for me. I just started. Blah, blah, blah. And it’s a lot of work.” So all these things come up, but – and I was waiting for you to finish to hear what you said – but she tells that on Wednesday. And by Monday, you’ve taken pretty much massive action on that. So where does that come from and what’s the first step there? And I keep wanting to break all these down because I think a lot of times it sounds so easy, but it’s not. And I know that it’s not because of what you say. But that to me is even fascinating because I know how many people don’t take that advice, or if they do, not necessarily where they’re going to take immediate action. So I’m curious as to all that stuff comes up, and you feel the fear, insecurities, all that, and then what happens when you leave or you get off the phone or whatever that is? And I think this is something that has really served me well in building this business mentality of “why not?” Why not just go really big because even if you shoot for the moon and fall flat, you’ll still land among the stars? I love that saying because it’s so true. And so, I was like, “All right. Let me do it. I know my stuff. I know my clients are getting results. I’m never going to feel ready. So just push myself a little bit and do it.” And so, I’m not saying this is the healthiest thing, but I kind of just suppress the fear, turn it off and just do what needs to be done. So when you take the emotion out of it and just focus on, “All right, if I wasn’t scared and knew I had to make this happen, what would I have to do?” And that’s what I did. [0:27:50] Chris: And what’s your first step then? I’m curious about this because that’s “to create a whole new course, blah, blah, blah.” All this sounds big. So I’m just curious how you then break that down so that you take action? [0:28:00] Luisa: Yeah, absolutely. So, thankfully, I’ve already validated the product because it was basically just taking what I was doing with my one-on-one clients and putting it into a course. So, thankfully, I was able to skip that stuff. There was no risk there. But then, I was thinking, “All right. So how am I going to gather a massive amount of attention and get people interested in this?” And so, what I knew was, “All right. Challenges on Facebook do really well.” And they do really well to get attention, get engagement. And, all right, if you have your own Facebook group, I know that creates a massive community for you as well. [0:28:37] Chris: Can you just explain what a challenge is and just break that down? [0:28:40] Luisa: Yeah, absolutely. So a challenge is a theme, event, anywhere from five to ten days, where each day you give participants a small thing to do so that it moves them forward towards whatever the end goal of the challenge is. [0:28:54] Chris: Can you give an example? [0:28:55] Luisa: Yeah, absolutely. So one of my own, for example, one of the latest challenges I did, I called it “the weekend empire challenge.” And it was build an empire on the weekends. One of the first day challenges was getting clarity on your idea. But we made it really simple. So it was like, “List all of the skills that you have right now that you could potentially do. And go out there and call three people and see if they would be interested.” So really tiny but important steps to move you forward. [0:29:25] Chris: OK. So you did you create one of those for this? [0:29:27] Luisa: I did. I can’t remember what I called it. I think like the “Own It” challenge or something to stand out and really market yourself. And so I did that. I just promoted it in other groups. And, thankfully, because I’d built those relationships, people joined because of that. And I think had maybe 100 to 200 people just join the group for that. And so, I was able to launch the group off with a bang. And this was just, remember, I had no following, nothing. And so, I was like, “This is pretty awesome.” Ran the challenge for a week and then opened my cart for the course. [0:29:27] Chris: Right from in the group? Like nothing, no e-mail list or anything? [0:30:26.] Chris: Give me that adviser’s number. So not being pushy or anything like that. And so, I did that. I must have messaged by 300 people over, yeah, I’m trying to think, maybe like five days or so. This was while I was still in my job too. And then what happened was a lot of people wanted to get on a call with me because I was still relatively unknown. And so I had to sell pretty much every package that I ended up selling for this first launch via a call. And I’m trying to remember the actual number. I think it ended up being 30 or 40 calls that I got on. I remember like a week and a half, and that’s really like messaging people, getting them on calls, and just manually selling it. That’s how I got my first sales. [0:31:56] Chris: Wow. So those calls, what would they consist of? [0:32:00] Luisa: They were just really great sales calls. So, thankfully, that gave me a lot of practice, where I would ask them about what they were struggling with. And if I felt that my program would be a good fit, I would talk about it, and share with them why this could help them, and talk about how I’d use the same processes to help my one-on-one clients. [0:32:21] Chris: How many of those 30 or 40 calls became sales? [0:32:25] Luisa: Yeah. I think I ended up making 15 sales. So it worked pretty well. [0:32:30] Chris: 40% or 50%. Wow. [0:32:33] Luisa: But, yeah, it was tough. [0:32:35] Chris: Yeah, OK. So you do that. And it’s fascinating because it’s way beyond when you first did that research about online businesses. And it’s mostly about you build it, they’ll come and you’re not doing calls or messaging 500 people or anything like that. So it’s really interesting to hear. So you have your first set of customers, where do you go from there? [0:32:58] Luisa: Yeah, absolutely. So at this point, I was kind of like, “Oh, OK. This first launch was really hard. But it was really cool.” I brought in close to $10,000. And that was my first taste of leveraged income. So it was really awesome. And I was thinking, “All right. Well, I can continue to bring in some more money because I hadn’t made enough up to that point to leave my job yet.” And I thought, “All right, so I know what I got is working, how can I really do this in the quickest, fastest way possible to really leave my job as quickly as possible?” And so what I did next was because I created so much momentum and intention from this launch, I used that to kind of do another small promotion right afterwards and bring on some more one-on-one clients. So I shifted my attention back to that because those are higher-paying clients. And that brought in a few tens of thousands of dollars. And then, I thought, “All right. So I am almost close to the point where I can leave my job, not quite, but I’m close. What is this last thing that I need to do?” And here’s the thing: it doesn’t sound like it from my story, but I am very risk-averse. So I like to minimize risk as much as possible whenever possible. And so, what I thought was, “All right. If I had another group program that I was going to be doing before I left my job and had a payment plan every six or seven months, that would give a six-month runway basically to continue to build my business.” And so, that’s what I did. [0:34:27] Chris: Was the first one all upfront? [0:34:29] Luisa: Yeah, all up front. And so, I thought at that point, the first program was getting ready to end soon anyways. And so, what I did was I spoke to the people in that program and I just massively over-delivered so much. I think this is something a lot of people miss. They think, “Oh, I get my first clients. And now, I can coast.” No. I over-deliver the heck out of that thing. And so what happened was I said to those people, “All right. This program is ending. There are two ways I can continue to support you. I have this bigger group program if you’d like to continue. Or if you’d like to work one-on-one with me, we can do that too.” And so, I had a really high percentage of people say “yes.” And that ended up bringing in, I think, maybe $20,000 in sales just from the upsell, which is more than the program itself. [0:35:16] Chris: Were more people interested in ongoing or the one-on-one coaching? [0:35:46] Chris: Gotcha. Yeah, wow. OK. So you leave the job, what was that feeling? [0:36:05] Chris: Your parents’ voice is in the back of your head yelling, “Don’t do it!” Right. OK. So, now, you’re on your own. You’re working. And, first of all, I’m curious how that transitioned from having like a very structured day around working even if it’s unstructured meetings and stuff like that. But how was that transition? How did you get it so that you’re able to just get stuff done? [0:36:33] Luisa: Yeah. You know, thankfully, because of the way I had transitioned right after I left my job, I was about to do this massive launch. So I didn’t really have time to give myself to figure it out. It was kind of like, “You have to do this by this date or else, you’re screwed.” I think when we put ourselves in situations like that, we figure it out. And I think that’s really what I did there, really just staying focused on what I needed to do at each step of the way. And that organized how I spent my time. [0:37:04] Chris: Would you walk me through that? So in terms of you have the big goal and then, I guess, it sounds like you have the broken down goals. So can you just walk us through how you approach goal setting and then actually getting stuff done? And you can use this as an example. [0:37:18] Luisa: Oh, absolutely. So the way I really set my goals and get stuff done is really straightforward actually. I decide what the goal is and then “reverse-engineer” how am I going to get it. So, for example, when I left my job, the first program actually I wanted to do, I just wanted to make $100,000 from that. And so, I thought, “All right. I’m trying to remember the price point. I think I needed 30-something people to be able to hit that.” And so, I thought, “All right. I need to sell this program and sell 30-something people into it.” And then it became about all right. So I have this tiny, tiny list. And based on the 1% conversion rate, I need about 3,000 people. And so, I thought, “All right. Here’s what I need to do: I need to create that pre-launch engagement again, but I need to make a whole bunch more people aware of it.” And so, what’s the fastest way to do that? Let me use some paid advertising. 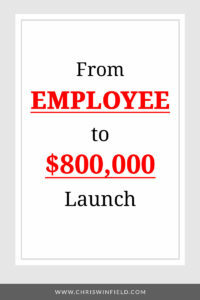 So I created paid advertising for that launch, focused on that. And then when the first people started coming and was coming, “OK. I need to give them this Facebook group to start seeing each other and all of that.” So it was just like bit by bit. And then I realized, you know, the challenge did well for me, but I need more people. And so I did a little bit more outreach on this launch as well, same as I’ve done for my first one. And then, I realized I really just need more traffic. And so, I created some webinars during the launch and drove more traffic to that. And so, it was kind of like, “Well, if this isn’t working, what can I do to fix it? Let’s just do it and iterate quickly.” That’s really how I planned it. [0:39:33] Chris: Yeah. It’s the example of a swan swimming and it looks so graceful and then you look at it underneath and what’s going on, and everything is a mess. I think that’s how it is for everyone. So what wound up happening with that? [0:39:49] Luisa: Yeah. So with that launch, I hit my goal. I made, I think, exactly $101,000, I think. So it worked out really well. And, again, I just over-delivered the heck out of it. And I was like, “How can I create the best thing ever? How can I just deliver so much value?” And so I went out there and did that. And because I did that consistently throughout, my students got really great results. And I think that’s really helped me build my business quickly as well, where they went out there, got just phenomenal results that aren’t usual for a group program. And with that, by the time I was ready to relaunch it, I had this great product that was so proven. And that’s when I knew I was ready for an even bigger goal. [0:40:34] Chris: And let’s just talk to that because I just want to make the whole transition from employee to then the launch that does nothing to a hundred thousand. And let’s go to like the 800,000. So what leads to that? What’s different this time? I talked about before was kind of like, “All right, this is really scary,” but then a few minutes later, “Why the heck not?” It is a little more difficult, but you’re doing the same amount of work to aim for a million as $250,000, so might as well go big. Go big, go home. So, once I felt into, “All right, well, why shouldn’t we aim for a million?” It was kind of like, “All right, here’s what I need to do: Same process that I worked through before.” It’s really as simple as what numbers do I need to bring in. Once you take fear out of the equation, what numbers do I need to bring in to have these conversions? What do I need to do? Plan each step of the way. And, thankfully, I’d already launch this one. So I knew what to expect and what to do. I will say the scariest thing about this was I knew that my list again was really tiny relative to what I wanted to sell. And so, I needed to drive more paid advertising. And I ended up spending about $80,000 to make the $800,000 which is worth it, of course. But at the beginning, I had no idea it was going to sell. And so, at that point, I think I put, before I made my first sale, over $30,000, just like investing in advertising. It was kind of like, “All right. This is a little bit scary.” Is it going to pay off or not? [0:42:27] Chris: Right. Over how long a period was that? [0:42:29] Luisa: About three weeks before I opened the cart. [0:42:32] Chris: Gotcha. All right. So you’re just like hammering it. And do you handle that yourself, the Facebook thing? [0:42:37] Luisa: I don’t anymore, but for that launch, I did. [0:42:57] Luisa: Oh my gosh, no. No, there is just no way. [0:43:00] Chris: OK. So, then what happens? [0:43:50] Chris: So what changes in how you feel overall when you hit or surpass a goal? What changes for you? [0:43:59] Luisa: To be honest, not much, which is so funny because you work towards this goal and you think, “Oh man, it’s going to change my life so much.” But what happens is in the process of striving for that goal, you already become that person who has hit it. And by the time you hit it, you’re already thinking about reaching for your next one. [0:44:17] Chris: Yeah. It’s never about what happens. It’s about who you’re becoming, which is why it’s so important to have the goals because it sounds like what you do is very similar. You just put yourself in this almost unrealistic situation in terms of time and energy and things. It’s how I work best as well. It’s definitely not the healthiest, but it is what works for me. All right. First of all, thank you for just painting that whole picture and walking through, because I know that it’s very easy, I think, for people to look at you and be like they read something or see this quickly or whatever, and just think, “Oh, it’s just so easy.” And I learned a bunch of things that you did. And I think the biggest one is just how you didn’t just take no in terms of online were always more of an ignore when somebody doesn’t buy right away. But you didn’t take that. You just kept going and I love that. So let’s just finish up with some other questions. So how do you decide what you’re going to work on each day? [0:45:17] Luisa: Yeah, absolutely. So, I think, again, it’s reverse-engineered, where I have this big picture goal that I have for the next month or three months. And then it packs into what do I need to do each week to be able to make it happen? And then, what do I need to do each day to be able to make what I need to happen for the week happened? And so, my philosophy is really simple: the more you can simplify your to-do list, the more things you can say no to, and work for that until-it’s not like I’m a super powerful multi-tasker or just do things really quickly. It’s just that I only focus on one thing at a time. That’s literally it. [0:45:54] Chris: Love that. So you’re a self-described introvert, right? I was reading in the right place. So how do you overcome the fear of self-promotion? So a lot of people who are listening would say, “How can she be an introvert? She messaged all these people, got in all these calls, did webinars, did all this and there’s a lot of self-promotion that has to come from this?” So how do you get past that? [0:46:18] Luisa: Yeah. And I’ll tell you. I’m still an introvert. And when I’m in a small setting, sometimes it’s still hard for me to promote myself, to be honest. But what it is I think it goes back to what I said earlier: how much you want that thing has to be bigger than your fear. This was such a powerful moment for me. At the very beginning when I was still trying to figure things out, I went to this conference in online world. And I just remembered this moment so clearly when there was this Q&A panel with experts who had really successful businesses that only have been around for a few years or so. And then there was this long line of people off the stage who are getting up and asking questions. And you could tell from the questions they were asking that they knew the answers already. They were just holding themselves back from having that. And in that moment, I think I had this light bulb moment, where I realized the only difference between those people on the stage and the people off the stage is they went out there and did it despite their fears. [0:47:57] Chris: I love that. And I think the other thing is that your desire to get whatever you want, it doesn’t have to be twice as much as your fear. It just has to be a little tiny less than a percent more than what your fear is. That’s it. I love that. What’s the last new thing you learned and why? [0:48:18] Luisa: Yeah, absolutely. I think the last new thing I learned, it’s not a tactical thing, but it’s just a reminder of how-I mean, this goes back to what we’re talking about, how you’re continually growing, how you’re never there and how you just need to continue being comfortable, because, for example, what I’m doing now is I’m looking to scale my business to the eight-figure mark. And a massive part of that is this automated product I’m setting up. And so, for the last three months, I’ve just been putting in so much time and money creating this product, and I just recently started testing this campaign. And I thought, “This is a proven product. I’m just automating it. It’s going to work beautifully,” of course, not. And I’ve been just spending and really pushing my risk tolerance there. And I was having this call with my mentor actually just yesterday, where she was brutally honest with me, thank goodness, which is what I needed, and she was saying, “You sound like a spoiled brat? You say, “This isn’t working. I’m so stressed out, etc., etc.” But think about what you’re trying to do. And you need to realize that where you’re trying to go, the way you’re acting is just so immature and arrogant. Take a step back and realize, yes, you’ve done some cool stuff, but there’s so much further to go.” And I think that was something really powerful, more powerful, I think than any like, “Oh, here’s a marketing tactic or something.” And something that I think is important for everyone listening to remember, again, it doesn’t matter where you are. There’s always that next step. You’re going to continue pushing yourself. [0:50:28] Luisa: Yeah. So there are a few. I think the top one is, again, it’s not a tactical thing, because I think the internal work is so important, the book “Psycho-Cybernetics” by Maxwell Maltz, because for the longest time, I had read books like “Think and Grow Rich,” and just thought, “What is this BS? I don’t understand it.” And it wasn’t clicking with me. It wasn’t until I read this book that I realized that the “scientific” reason behind why everything you want is truly within your reach if you are willing to get out of your own head. And I think that book just completely changed my life and made me realize that “Oh my gosh. That’s really the case. It’s all about what’s in your mind and your programming.” And that really set me on this path. So I would say that’s the number one book. [0:51:15] Chris: Perfect. What’s the best piece of advice you’ve ever received? [0:51:18] Luisa: Oh my gosh. I think, yeah, you know the best piece of advice I’ve ever received is “why not?” Just go for it. What’s the worst that could happen? You’re not going to, I’m not saying, “Go out there and spend $100,000 to set up your business.” But if you spend 500, 1,000 or whatever you can afford to spend, what’s the worst that can happen? And the upside, you can’t even imagine. [0:51:41] Chris: I love that. Where can people go to learn more about you? [0:51:45] Luisa: Yeah, absolutely. Super simple. They can come to my website which is my name. It’s www.luisazhou.com. And if they want to engage with my and my community, my Facebook group is called “Entrepreneurial Women.” So super easy. There’s a picture of my face on it so you can’t miss it. [0:52:05] Chris: I’ll link them both up in the show notes. Luisa, thank you so much for sharing everything and sharing your journey, and just being so real. It was amazing. I got so much out of it. [0:52:15] Luisa: Thank you for such an awesome interview and such great questions. I had so much fun. And I’m really glad we got to dig deep and talk about what really goes on behind the scenes. [0:52:24] Chris: Exactly, thank you. Hey, guys. I really hope you enjoyed today’s interview with Luisa Zhou and getting an inside look at the ups and downs, experiences, beliefs, books, people that led her to where she is today, and what she does to keep moving forward and become a better marketer/leader/creator, and ultimately, a better person. As I was listening back to this interview and reflecting on my conversation with Luisa, I was reminded of something that Dale Carnegie once said, “Inaction breeds doubt and fear. Action breeds confidence and courage. If you want to conquer fear, do not sit home and think about. Go out and get busy.” Luisa is a great example of someone who continue to take action, conquer her fears and now helps others to do the same. For all the show notes, links, resources, transcript and downloads, head down over to www.chriswinfield.com/12 to get everything from today’s episode. If you enjoyed listening to this episode of my new podcast, then please support the show by leaving a subscribing on iTunes and leaving a review. It’s easy and takes about 30 seconds to do! This was a really informative and well done interview. It’s interesting that Lisa was successful by all outward appearances but felt something was missing in her life. She was looking to matter and have an impact. And boy did she skyrocket to the top. I don’t think I’ve come across someone who would probably consider themselves a novice just jump all in on a business not knowing if it would fully work. This is what separates those who have businesses and those with hobbies. She took action, put money down and said will figure it out as go. Very good to have clear objectives to reverse engineer from as she has done. And the fact it came down to knowing her numbers and then the fastest way to get there is through paid traffic after I guess realizing in her previous life that blogging and other formats were not her cup of tea. And kudos to the interviewer on the question selection and driving the conversation with followup questions. Money is really important part of our life. it helps us to get the things we need. This is without any doubt a very interesting and informative article for everyone who strives to self-develop and improve. I believe that an employee who does not stop developing can become a real professional and earn good money. Definitely for me it was interesting, because it is useful to read how a person shares his experience in achieving the goal.